Saltado is a dish that typifies Peru’s multicultural cuisine. 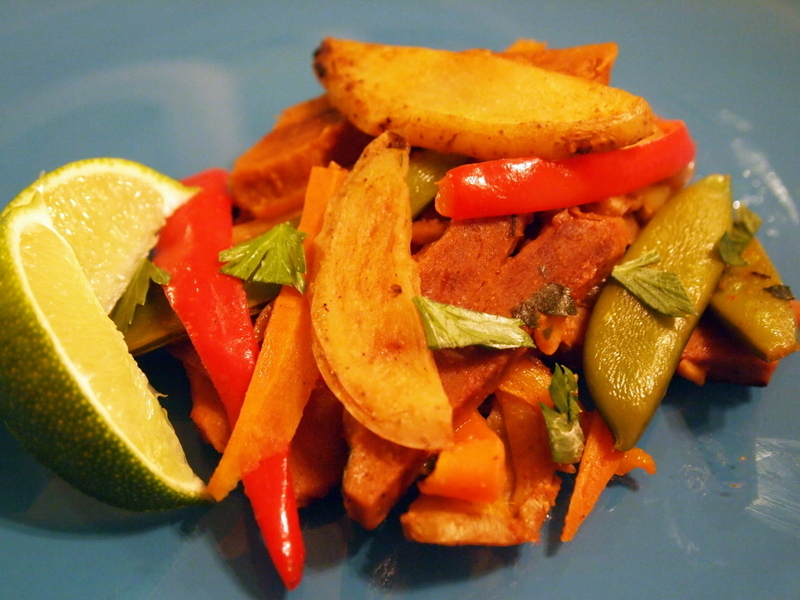 It is essentially a stir-fry that combines eastern and Latin flavors with fried potatoes. It is fairly easy to find vegetarian saltados in Peruvian restaurants, but the most popular version by far is beef loin, or lomo, saltado. 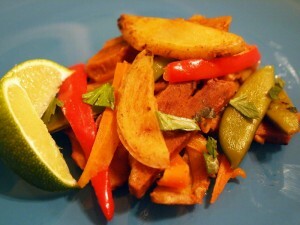 This recipe uses wheat roast instead of beef, but portobello mushrooms, seitan, and tofu all make great saltados as well. 1 pound wheat roast, cut into 1/4-inch thick slices. Liberally coat a baking sheet with cooking spray. Arrange potato slices in a single layer and spray with oil and season with a pinch of salt. Cook potato slices in the oven, preheated to 300 degrees Fahrenheit. Allow to bake for 20-30 minutes until golden brown. Remove from the oven and set aside. Heat olive oil in pan over medium-high heat. Add onions, garlic, and ginger and saute until fragrant, about 1 minute. Add wheat roast and saute for another minute. Add ají, tomatoes, snow peas, peppers, parsley, spices, vinegar, Pisco, and soy sauce. Cook until tomatoes are softened and the peas and peppers are tender. Add prepared potatoes, and quickly toss together. Remove from heat when all ingredients are at a consistent temperature. Sprinkle with lime juice before serving. Serve with an ají of your choice.